The VK Professional II has been tested, proven, and then tested more in some of the most bone-chilling conditions on earth. Every part of this snowmobile, from the bodywork, to the riding position, the engine, the track and the chassis has been manufactured and designed with one goal in mind, to make it the best utility snowmobile on the market. 1049cc Engine: Fuel-injection betters throttle response and fuel-efficiency, while the increased displacement of the 1049cc engine offers more power in the broad, useable manner utility snowmobiles need. Idle Speed Control (ISC): Idle Speed Control optimizes fuel volume ratio for predictable idling when the engine is warm, and by improving cold-weather starting by increasing fuel amount. ISC also minimizes engine braking by reducing intake vacuum pressures for a more natural feeling when off-throttle. 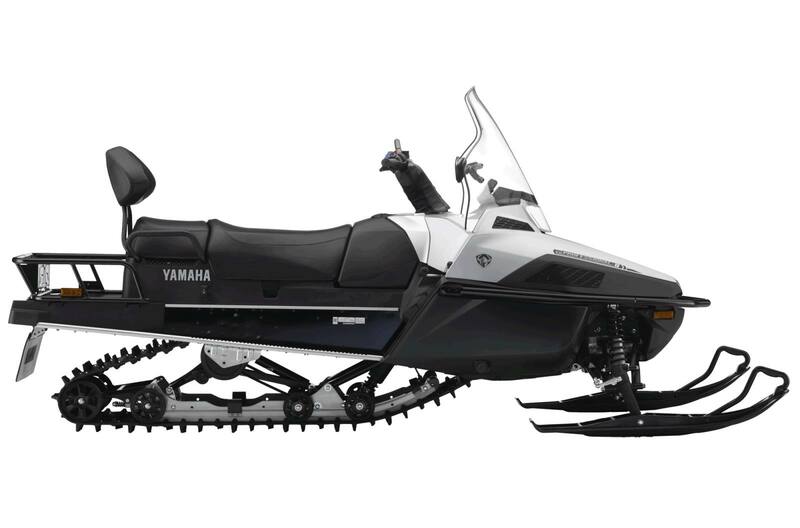 Revised CVT Settings: By controlling the belt clamping force, Yamaha engineers have improved engagement for a much smoother take off, while still providing improved power and towing capability at mid to high range. Dual-shock Torsion Spring Rear Suspension: This 20-inch wide torsion spring skidframe has been designed for the best combination of handling, stability and deep snow capability. It has two 40mm high pressure gas shock absorbers to better control damping forces. Ride comfort is improved and bottoming is reduced. The flip-up rail helps for reversing in deep snow, making it easier to back up when you need to. Camoplast Cobra WT Tall Lug Track: The primary purpose of the 20" x 154" x 1.5" Cobra track is to fully maximize all available snow with confidence-inspiring deep snow floatation and powerful pulling force. The 1.5" lug is perfect for low-speed or high-load situations that utility sleds often function in. 44L Fuel Tank: A 44L fuel tank is increased in size from the previous version to allow for longer trips between gas stops. The shape of the fuel tank has been slimmed down to provide for more comfort and an improved riding position with more focus on mass centralization. Extrovert Drive Sprockets: Extroverts are designed to make sure the power from the Genesis 4-stroke is always put to the ground. They reduce track ratcheting, especially in the high load situations that can be produced by the 20" wide track. More Upright Seating Position: The seat height and handlebar position have been set 50 mm higher than those of the current RSViking Professional. This creates a riding position that allows for greater choice and flexibility of riding posture, from a seated upright riding position to stand-up riding for deeper snow and the like, while also enabling an optimal operational feel. The newly designed seat features revisions in the firmness and thickness of the urethane cushioning material to ensure good cushioning even at extremely low temperatures. Functional Design: The exterior design has taken into account the fine snow mist that can enter the cowling in very cold climates. The VK Professional II was designed to reduce snow accumulation on the unit and entrance into the engine quarters. A strong, wraparound front bumper protects the snowmobile. Redesigned Windshield: Revised windshield allows for better wind protection for rider and passenger, as well as incorporating the mirrors inside the windshield for better durability. Dual Range Transmission: Set your pace with Hi and Low range for even more versatility. Low range offers improved pulling power, low speed drivability and belt longevity. High range offers improved top speed, fuel economy and range. Purpose Built Front Suspension: Fully independent double wishbone front suspension features gull-wing a-arms for better control and increased ground clearance. Electric Start and Reverse: Turn the key to start it up, select reverse to back out of those tight situations. It's that easy.